“My biggest joy with multiple sclerosis is learning how to allow life to be life on life's terms.” — Bobbie G.
HealthCentral: Bobbie, when were you diagnosed with MS? What led to your diagnosis? Bobbie: I was diagnosed with multiple sclerosis on December 17, 2014. I had terrible pain in the side of my face on and off for about eight months, but no doctor could find an answer to what it was. When my primary doctor finally sent me for an MRI, I was full of lesions. I also had optic neuritis [which was a surprise because doctors attributed my vision loss] to the fact that I am going blind from a rare genetic disease called retinitis pigmentosa. Bobbie: At first, I was extremely scared. For the first year of my diagnosis every ache, every pain, every sadness, I attributed to MS. The only person I knew with MS was an uncle who was bedridden and dying. So to me, MS meant a death sentence. But then, over the past six months or so, I lost four relatives to different illnesses and sudden deaths. That has really opened my eyes to living for the moment, with or without MS. Now, I’m on a really good disease-modifying therapy and have a lot of hope in my remission. Bobbie: I have made more emotional changes than physical changes. I have learned to stop and smell the flowers as they say. I've learned to dance in the rain and to be happy. I choose happiness over waking up every day sad or scared. None of us are guaranteed tomorrow, which I found out the hard way when my dad died suddenly back in October. I'm taking it as a new lease on life. We’re not guaranteed any certain amount of time, therefore let's just enjoy the time that we still have. Bobbie: My biggest fear with multiple sclerosis is waking up tomorrow morning and not being able to be the mom that my 10-year-old son knows and deserves. I'm scared I won't be able to walk. I am scared that I won't be able to talk. I am scared I won't be able to think straight and I'm scared that I will let my son down. I don't want my son to be my caregiver; that would not be fair to him or to me. I feel like there are times that I'm angry and bitter because I've got this amazing child that I adore... and I'm scared I'll lose the ability to care for him properly. Bobbie: My greatest joy about having multiple sclerosis is that I don't freak out over the silly things anymore. It's not such a big deal if dinner burns or if the house isn't scrubbed to the max. It's not a big deal if my son stays up an hour late. I enjoy the here and now because I don't know what tomorrow will hold. So my biggest joy with multiple sclerosis is learning how to allow life to be life on life's terms. It's like a breath of fresh air sometimes. Bobbie: If my MS were an animal, it would be a snake. Goes without saying that snakes are very sneaky; they pop up on you when you least expect it. But if they’re handled properly, snakes can be very loving, intelligent animals. I don't like my MS flares and symptoms, but if handled properly, they can be more comfortable and manageable. Bobbie: It’s not so much that my goals have changed since learning about MS. I’ve learned to live with it, although I did have to retire. I think anybody with an incurable disease or health issue appreciates life differently and strives harder to accomplish the things that people think they can no longer do. It's very hard balancing what I know I can't do anymore, and allowing myself to let those things go and ask for help, with allowing myself to push myself to do the things I can still do. Bobbie: In everyday life, smile, choose happiness, try to be logical and allow yourself 15 minutes to cry about it. Maybe even 15 minutes every day to just be angry. Be bitter, be sad, and then pick yourself back up and march forward, wheelchair or no wheelchair. MS is our burden to carry and I honestly believe we can walk through it, metaphorically speaking, and see the other side. It really is all about perspective. There are people that may have a worse condition than MS and there are some people that have no conditions with their health. I have what I have and I deal with what I go through. Today I'd like to think that I look at the glass as half full because there is no other option. 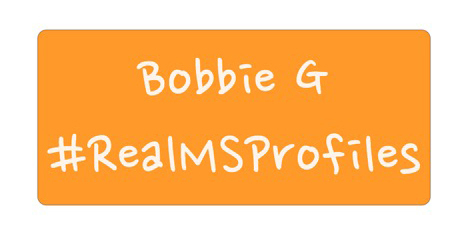 Bobbie: Be in a real relationship with your doctor or MS specialist. Take what they say and think about it logically. Communicate with your doctors because they're not out to hurt you. They want to help you manage your symptoms and help you get through each day. If you and your doctor do not see eye-to-eye and you don't like them from the get-go, find a different doctor because your relationship will never mesh well. I learned this the hard way. Now I’m really satisfied with my doctors and it's a very big stress relief to be on the same page with my treatment plan.